KOKO-EN was built in commemoration of Himeji City becoming a municipality in 1992. 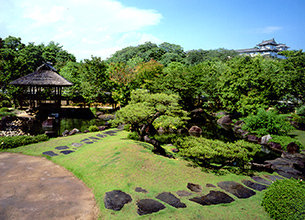 KOKO-EN, Himeji-Castle-Nishi-Oyashiki-Ato-Garden, is 3.5 hectares/8.5 acres in size was opened 29 April 1992 to commemorate the 100th Year Anniversary of Himeji becoming a municipality. It is a new cultural site to serve not only for historical and cultural preservation, but also complimenting the UNESCO World Heritage HIMEJI CASTLE. Prior to it's construction, seven research excavations were done at KOKO-EN which verified it as the former site where “Nishi-Oyashiki” / “Himeji Castle Lord's West Residence” and other high ranking Samurai homes were located. Some original passage ways, as constructed by HIMEJI CASTLE Lord Honda, Tadatoki (1618), were found here. Such can be seen here by the historical map of HIMEJI CASTLE and KOKO-EN area, during the time of Himeji Castle Lord Tadazumi Sakai's reign. (1749～1772). The design and supervision of Edo Period KOKO-EN was under the supervision of Professor Makoto Nakamura of Kyoto University. KOKO-EN's nine different size gardens are based on the original layout of historical residences and passage-ways. The garden’s passage-ways are traditional mud walls, called “Tsuiji-bei”, with roof-tiles where you will see beautiful wooden gates like “Yashiki-mon” (gate to “The Lord's Residence”) and “Nagaya-mon”, a traditional style gate with two guard-rooms. Also, there is “Kassui-ken” Restaurant and “Cho-on-sai” (“The Guest House”) connected by a “Covered Corridor Bridge”, of traditional design, made of Japanese Cypress wood. You can visit “Tea Ceremony House” called “Souju-an”, which is a “sukiya-zukuri” style structure with design and construction supervised by “Sen Soshitsu”, The 15th Urasenke Grand Tea Master. These various beautiful gardens are connected by flowing streams, waterfalls and ponds, with the grand UNESCO World Heritage HIMEJI CASTLE as a beautiful backdrop to KOKO-EN making an elegant view in harmony with Japanese History and Nature. "Koko-en" was named after the clan "Koko-do"
KOKO-EN was named after “Koko-do”, the name of the Provincial School for Literary and Military Training which was first established (1692) by the samurai “Sakai Clan”in current Maebashi City, Gumma Prefecture. This military-school was later moved to HIMEJI CASTLE by Lord Tadazumi Sakai when he was given command of “Himeji Feudal Domain” and HIMEJI CASTLE (1749). 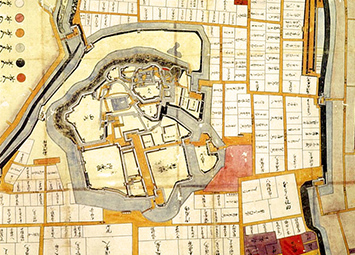 During Lord Sakai's reign at HIMEJI CASTLE, he continued to support and expand “Koko-do” into an important military-school in Himeji, which had been located in 1842 at the area west of HIMEJI CASTLE of what is now KOKO-EN Garden. 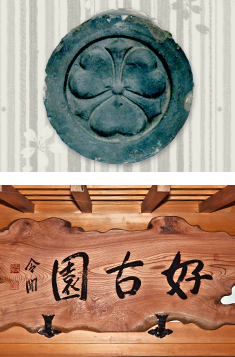 The importance of Lord Sakai's contribution to the success of “Koko-do” at HIMEJI CASTLE is reflected in the name “KOKO-EN” as seen on the wooden sign shown at the entrance gate of KOKO-EN. These special Kanji Characters were written by the former Tokyo University Professor, Mr. Reimon Yuki, the son of Gimon Yuki, head of the tutoring school later opened by Mr. Atsunori Matsudaira a supervisor of “Koko-do” in Himeji.